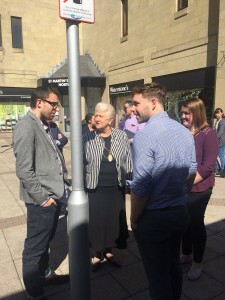 On Thursday (23rd June), on a very sunny day in Perth, a vintage 1966 Routemaster bus was the meeting place for new and aspiring entrepreneurs, and the local business support agencies that can help them. 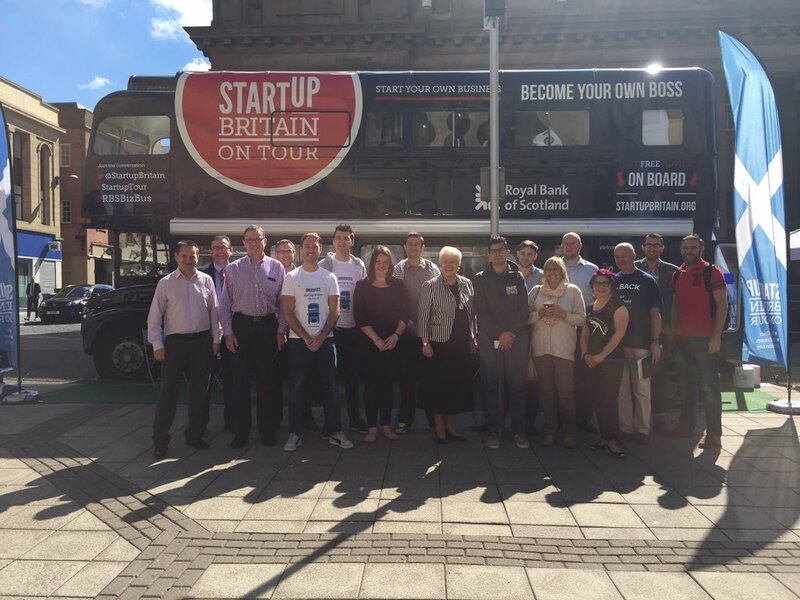 This was the fourth stop on the Scottish leg of this year’s Startup Britain Bus Tour, having already visited Glasgow and Edinburgh on the previous two days and with a stop planned in Aberdeen on the following day. Now in it’s fifth year, the Tour serves to encourage and promote entrepreneurship across the UK and bring together the entrepreneurial ecosystem in the various destinations. This year’s Startup Tour was launched at Buckingham Palace on Monday 13th June, with the ambitious intention of visiting over 30 towns and cities over the next 6 weeks! 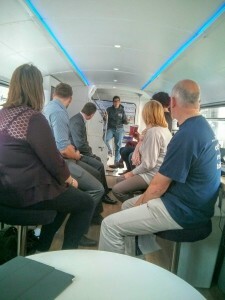 Whether you’re just thinking about starting a new business or have already taken the plunge, the support offered by the various support agencies and individuals on the Startup Britain Bus Tour includes: speed mentoring, signposting and specific business advice, in areas such as marketing, finance and law. In Perth, there was a wide variety of support available from public and private sector organisations. Those that attended from Perthshire included individuals from: Perth and Kinross Council, Business Gateway Perth & Kinross, Perth College UHI, RBS, GrowBiz, Women’s Enterprise Scotland, Firstport, Fraktul and your’s truly, from Acorn Enterprise – not to mention a very enjoyable visit from the Provost, Liz Grant, whose passion for enterprise was clear to all. Kosta Mavroulakis, Campaign Manager of StartUp Britain said “Perth’s entrepreneurial ecosystem offers something for everyone with a lot of support available from the local business support organisations who are passionate about helping local entrepreneurs to get started and grow”. Jackie Brierton, Enterprise Manager at GrowBiz, explained, “GrowBiz is a unique, community-based enterprise support organisation working in rural East and Highland Perthshire. We provide a combination of 1-1 coaching, peer support groups, learning sessions, mentoring and networking for anyone who wants to start – or grow – a business or social enterprise. Isolation and loneliness can be the biggest barrier to developing a successful enterprise, particularly in rural areas, and GrowBiz provides connections and flexible support whenever people need it in their business development journey. It works with around 150 entrepreneurs annually and in the coming year is planning to extend the same approach across the rest of rural Perthshire in collaboration with local partners”. 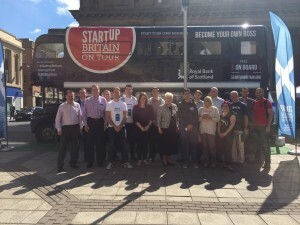 The Regeneration Projects Team Leader at Perth & Kinross Council, Alan Graham, said, “We were delighted to host our first visit by the Startup Britain Bus Tour as it played into the wider efforts by the Council and partner organisations to support the development of the entrepreneurial ecosystem and highlight the range of support for start-ups. Economic development priorities are to develop key sectors of the economy including tourism, food and drink and the creative industries and these are areas with great potential for new starts and going forward we are conscious of the need to continue collaboration with partners such as Business Gateway, reduce any apparent clutter and to present a more joined up picture for individuals who are looking for start-up advice and support”. “Perth College UHI continue to work collaboratively with other local support agencies to provide Perth and Kinross Business & Enterprise Month and the free events that run at that time”, outlined Heather Boag, Business Link Manager at Perth College UHI Centre for Enterprise. A Healthy Fast-Food Restaurant, A Franchise and Patents! 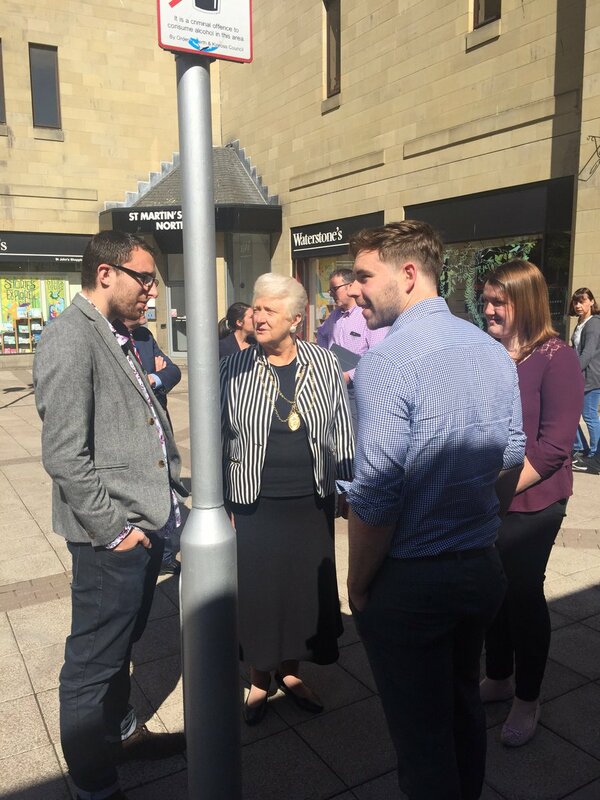 Personally, I spoke to several people with business ideas (both onboard and off the Bus!) and these ranged from healthy fast-food restaurants, individuals with interesting patents and someone who had just purchased a franchise – a very eclectic mix of people with business ideas from a variety of different sectors. For these individuals that I spoke to, my guidance wasn’t based on forensic knowledge of franchises or an in-depth understanding of fast-food but rather real practical knowledge of what it takes to launch and grow a new business in 2016 and beyond, gained from working with the start-up community in Scotland for over five years. Acorn Enterprise has worked with over 160 individuals since we launched via our 20 week Business Accelerator Programmes and Acorn Business Bootcamps! Therefore, m y advice was simple in many respects, for starters: how can you test your idea without “betting the house”? In other words, how can you prove there is a market for your idea without putting it all on the line – for example, perhaps a pop-up stall will give you some real market research, as opposed to reading some outdated market research report that wasn’t specially designed for you in the first place. Secondly, think about your existing contacts – who do you know that can help you with your idea, whether that’s with funding, resources or advice? Learn from the failures and triumphs of others in order to fast-track your own success. And have a look at the other agencies locally and around Scotland that can help you take your idea forward e.g. to the gentleman I spoke with about the patents, I suggested he look at Bright Ideas Scotland to help him get his product ideas to the next level. I also mentioned rapid prototyping and 3D printing, something we offer through our Acorn 3D Printing services (of course, other options are available!). Thirdly, before you commit to launching a business, you have to be honest with yourself and speak to those in your life that it also affects. In many respects, your friends and family can be the WORST people to speak to when you have a new business ideas, and we covered this in a previous blog here. However, when launching a business with a co-founder or several business partners, it’s paramount to ensure that your goals and values are aligned, otherwise disaster is sure to ensue. You need to have a transparent conversation about: what you each want from the business, what exactly you’re “bringing to the party” (e.g. skills, cash or contacts) and what you want to do with you life – this may sound a little out there but it’s important to discuss this at the start to avoid nasty surprises further down the line. A Lively Round Table Discussion! After a busy, yet enjoyable, day of offering aspiring business owners some guidance, the day culminated in a Round Table discussion, which brought together the various organisations in Perthshire. I was delighted to be selected as one of StartUp Britain’s Scottish Local Champions to chair this discussion as one of Startup Britain’s Enterprise Champions for Scotland and I sought to explore the positives and challenges with respect to starting up and growing a new business in Perthshire. A very energetic conversation ensued with all participants of the Round Table throwing suggestions forward. A strong sense of community and togetherness. Sector strengths in Food & Drink and Hospitality – with several people claiming Perth city has one of the highest densities of restaurants in Scotland (160 in the city-centre!). A real sense of pride in Perthshire as an area from its residents. Low unemployment compared to the Scottish average. Public-led initiatives such as the “Angels’ Share”. GrowBiz, in particular, was mentioned positively throughout the whole day by many people. Lack of/poor Broadband, especially in more rural parts. No large businesses, hence, employers. Guilty of not enough self-promotion, with particular respect to tourism. Perth & Kinross Council claim to be “open to new ideas” but some suggested they lack vision and a willingness to try anything new. Use social media and other marketing more to shout about things going on in Perthshire – one great revelation was #PerthshireHour, which takes place on Twitter every Wednesday evening at 8pm. Make an effort to get to know the other local support agencies better and how they can work closer together from now on. Explore running this sort of Round Table event on a more regular (possibly monthly) basis to solidify the Perthshire entrepreneurial ecosystem. I’m going to continue lobbying for an Acorn Enterprise Business Accelerator in Perth as I (from a somewhat biased standpoint, of course) fundamentally believe it would not only help the area tackle some of the above challenges head on but also capitalise on the many strengths. It would promote and encourage entrepreneurship as a viable career, foster a greater culture of enterprise and allow Perthshire to grow specialisms in sectors other than Food & Drink and Hospitality. As we say at Acorn Enterprise, “Remember, from little (Perthshire) Acorns…mighty Oaks grow! There is also a whole host of support available across Scotland that is also available like Entrepreneurial Spark, Enterprise Campus, Young Enterprise Scotland, First Port Funding, UnLtd Scotland, Women’s Enterprise Scotland, UK Business Advisors Scotland, Scottish EDGE, Business Gateway and Accorn Enterprise, amongst many others.